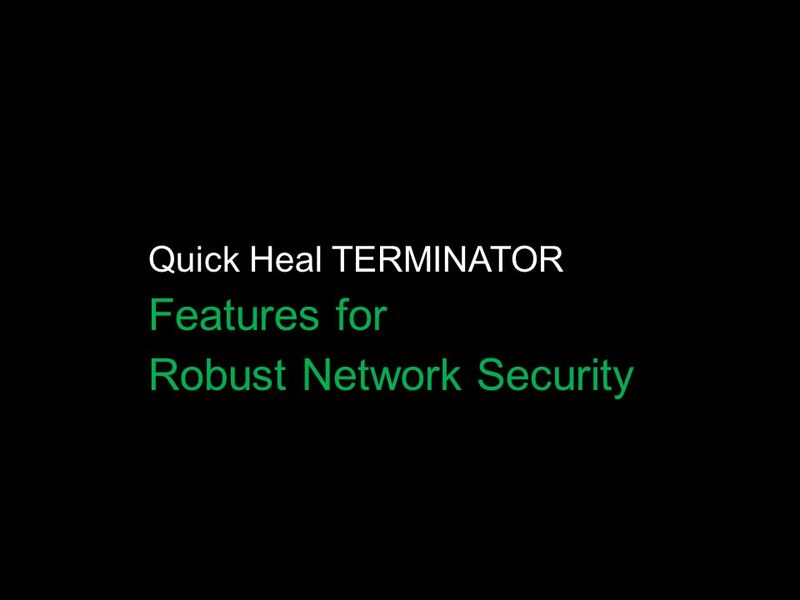 A solution that emerged out of the need to stop blended and insider threats and newer attack techniques that target the user as the weakest link for corporate information systems. 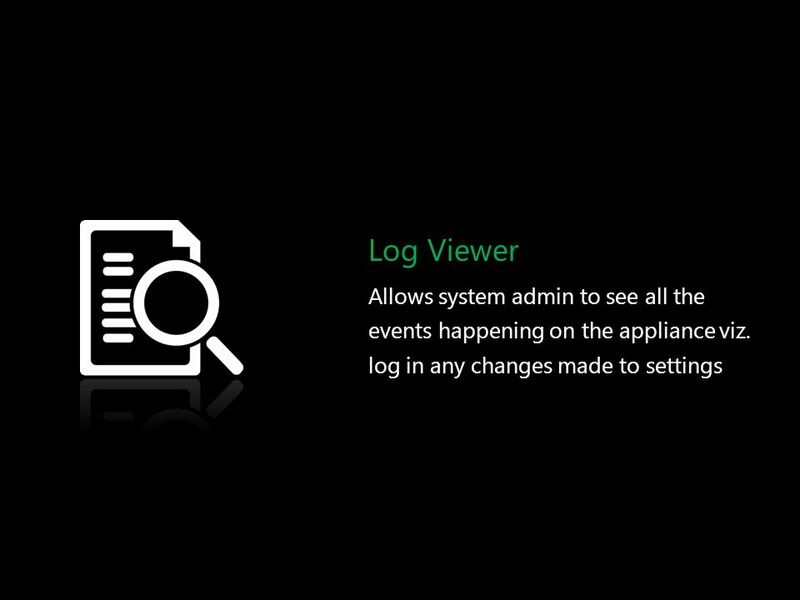 Ability to perform multiple security functions in a single appliance and managed through a single console. A comprehensive solution. Recent inception in network security industry since 2004. 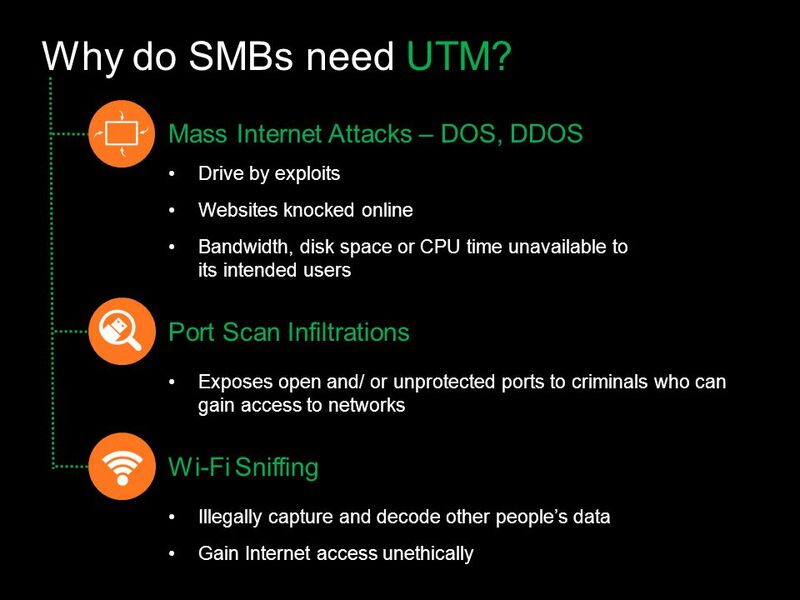 The term Unified Threat Management (UTM) was originally forged by IDC , a leading IT market research firm. Competence being the best asset, one data leak can ruin all that effort Repercussions to your credibility, reputation and finances Budget constraints to appoint experts for IT security needs. Typical attackers do not target individuals or businesses – they target vulnerabilities. Every computer attached to the Internet is a target. 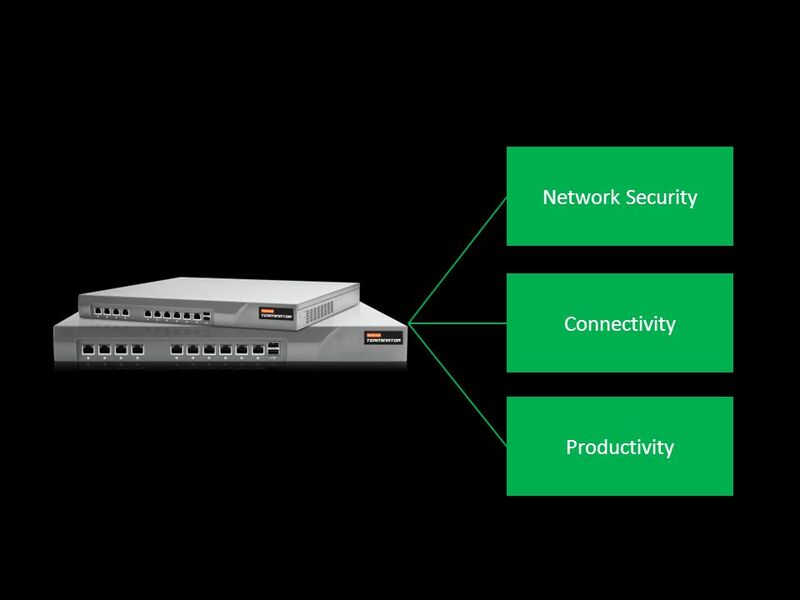 7 Why do attackers want any and all networked computers? Any PC can be used as a spam relay. Any PC can be used as an illegal file repository. Any PC can help put a foe out of business. Any PC can host a phishing site. 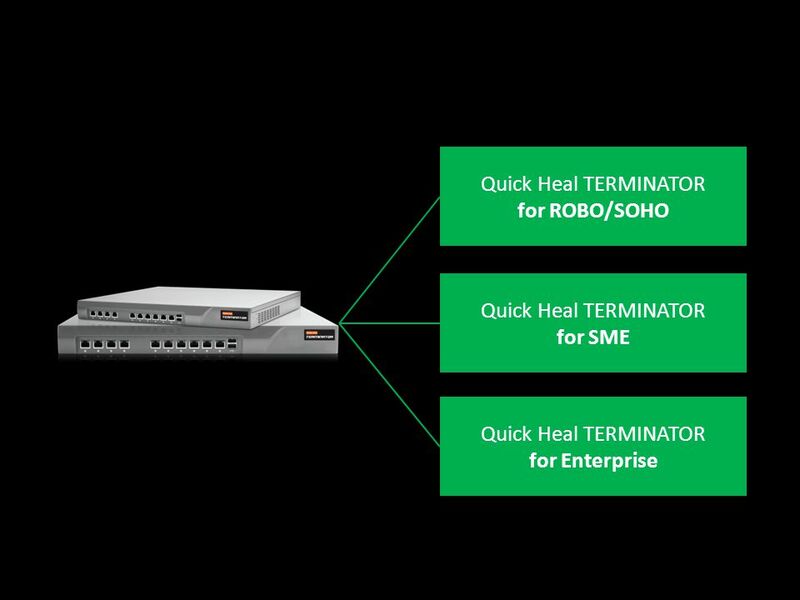 12 Firewall Administrators can block or allow access, for each protocol, to each internal network, user and user group. 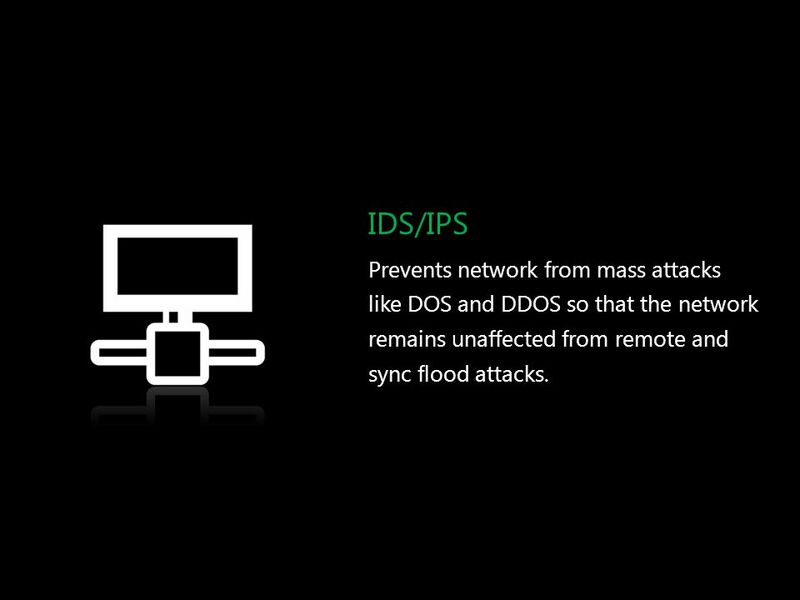 13 IDS/IPS Prevents network from mass attacks like DOS and DDOS so that the network remains unaffected from remote and sync flood attacks. Restricts or authorizes Internet access for users based on authentication credentials. Scans inbound and outbound messages and attachments. AntiSpam scans and runs a series of tests on inbound messages. 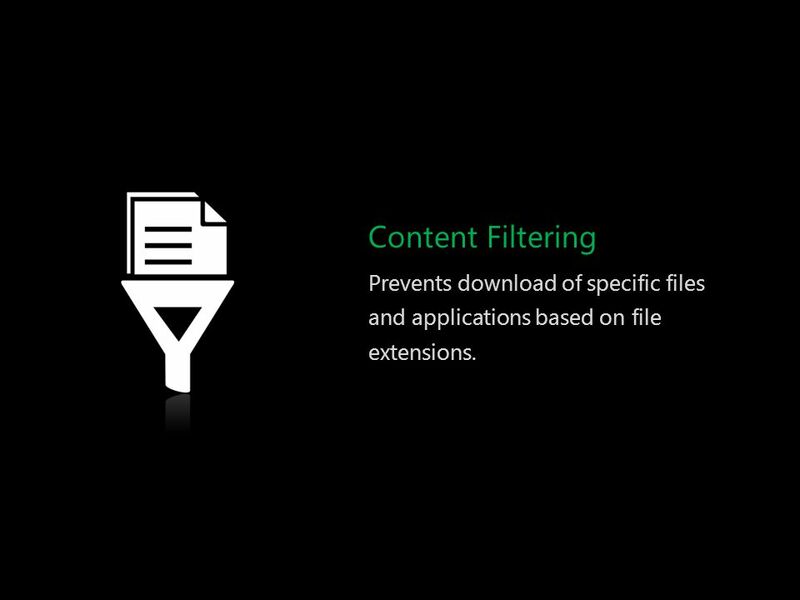 17 Content Filtering Prevents download of specific files and applications based on file extensions. 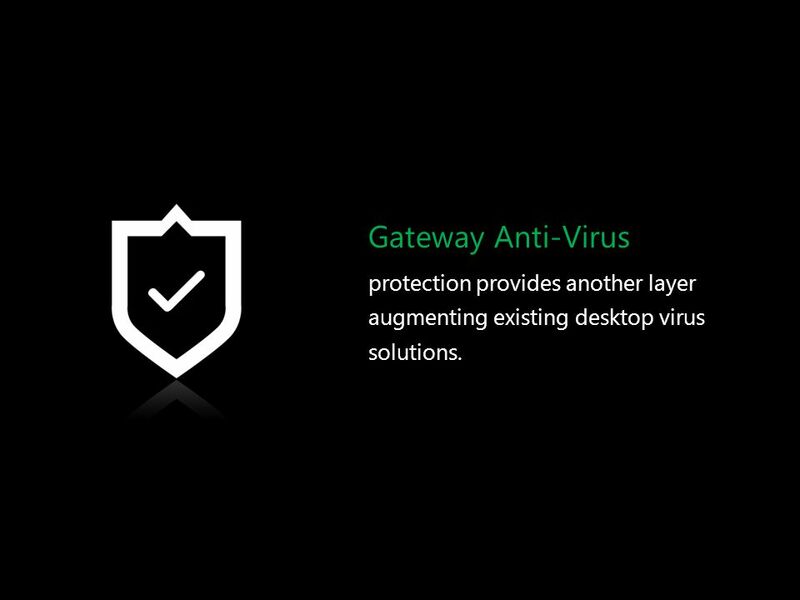 18 Gateway Anti-Virus protection provides another layer augmenting existing desktop virus solutions. 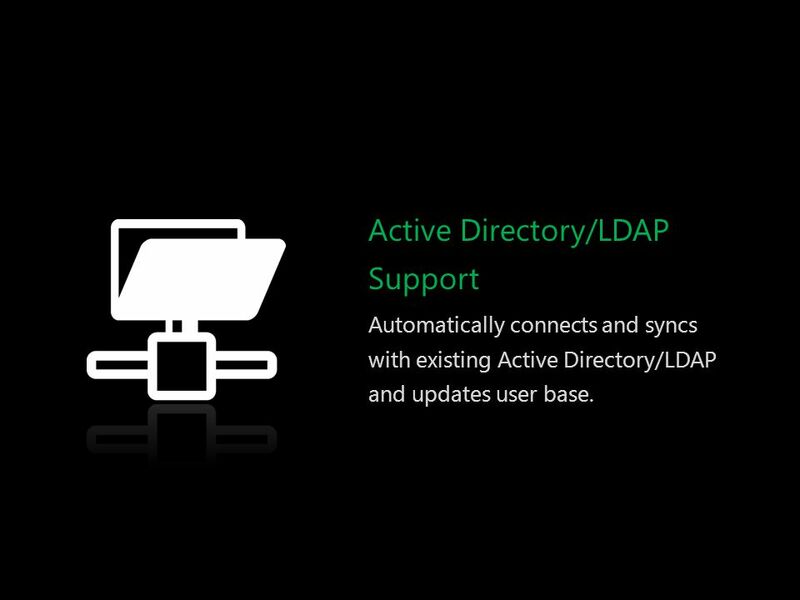 Automatically connects and syncs with existing Active Directory/LDAP and updates user base. 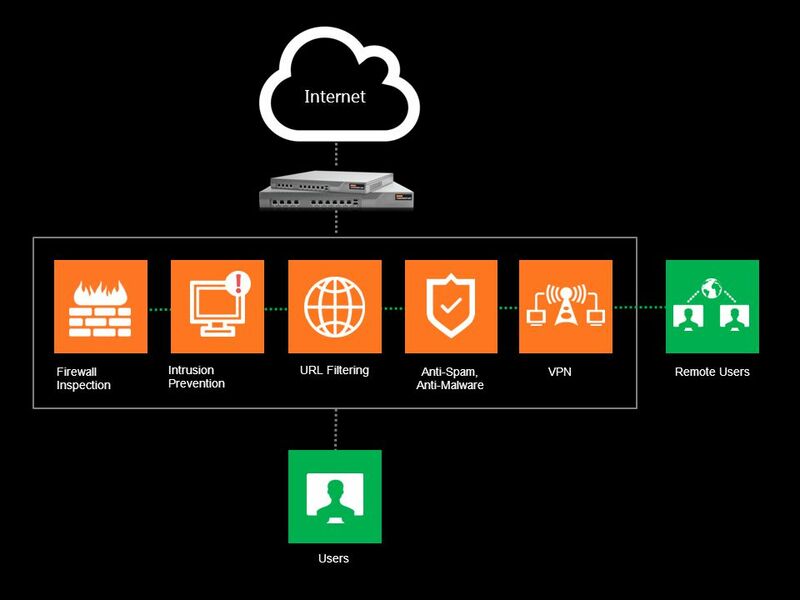 21 VPN Provides the IT administrators means for secure communications with the company’s remote users and for building secure site-to-site connections. 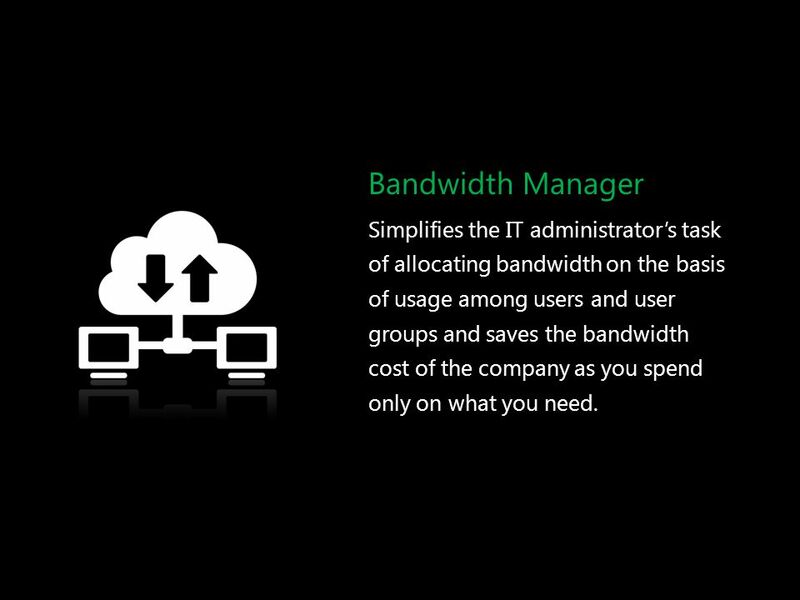 22 Bandwidth Manager Simplifies the IT administrator’s task of allocating bandwidth on the basis of usage among users and user groups and saves the bandwidth cost of the company as you spend only on what you need. 23 IPv6 Enabled The appliance is ready to support IPv6 based networks. 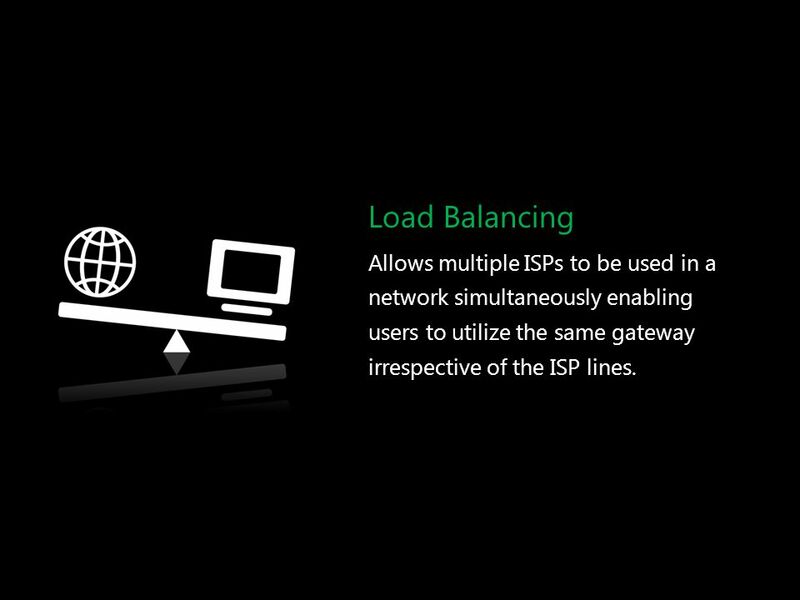 24 Load Balancing Allows multiple ISPs to be used in a network simultaneously enabling users to utilize the same gateway irrespective of the ISP lines. 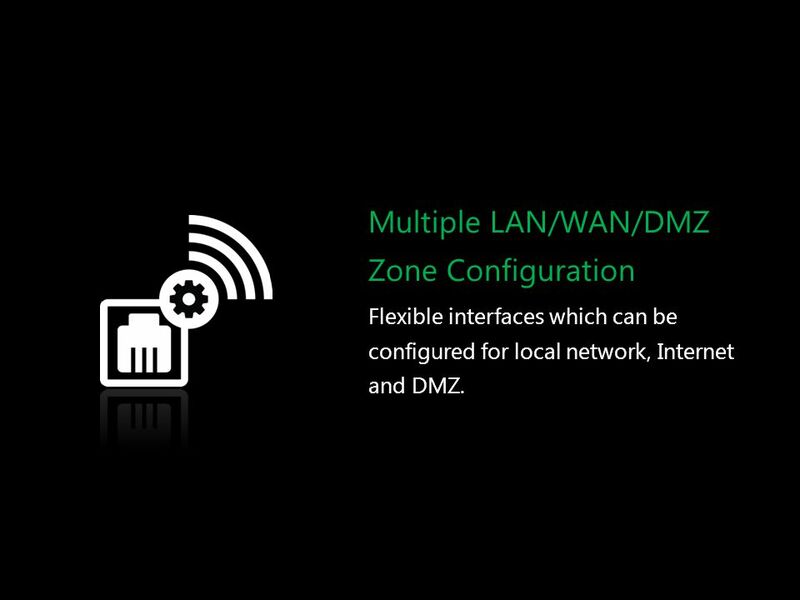 Flexible interfaces which can be configured for local network, Internet and DMZ. 28 Detailed Reports Provides on appliance extensive reporting of top websites accessed, policy breaches and bandwidth usage. 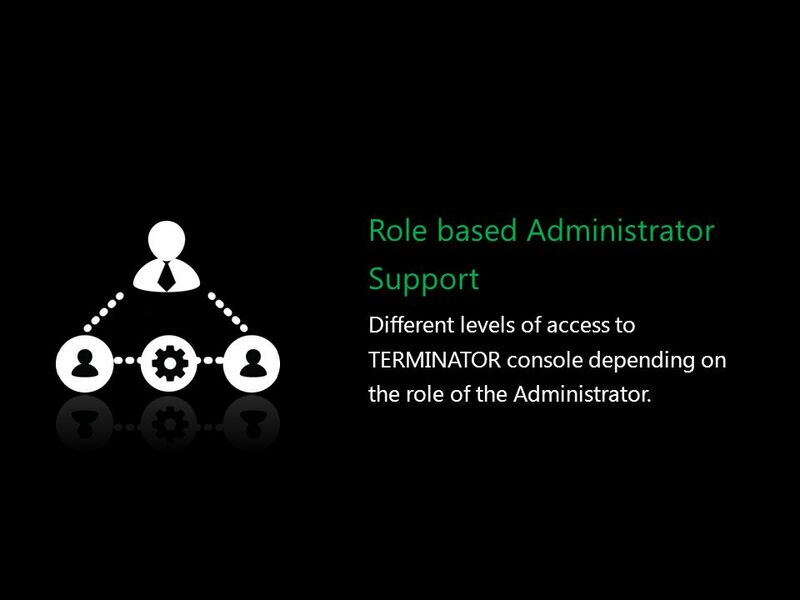 Different levels of access to TERMINATOR console depending on the role of the Administrator. 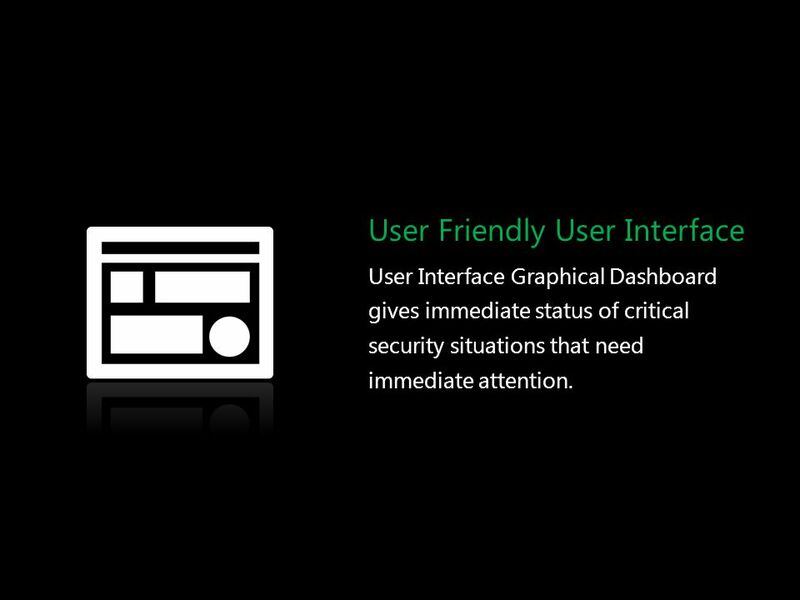 User Interface Graphical Dashboard gives immediate status of critical security situations that need immediate attention. Allows notifications to be sent to configured addresses and numbers. 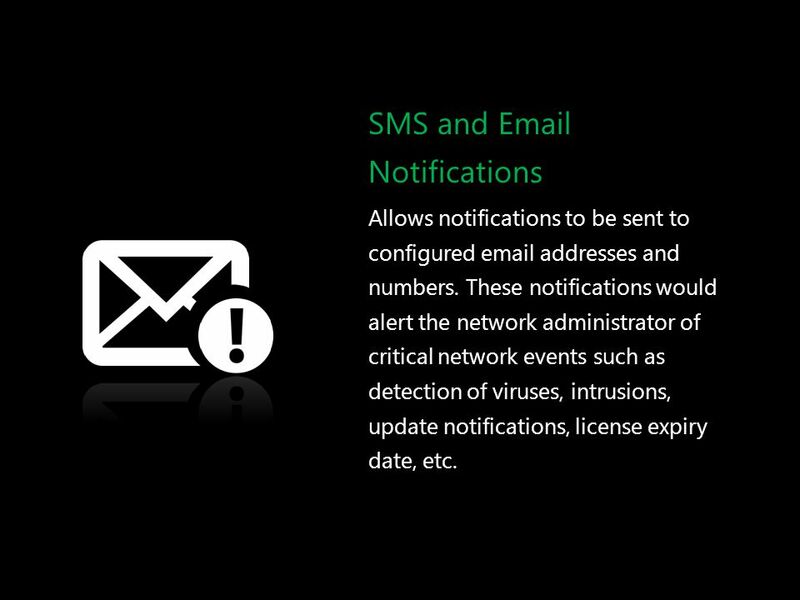 These notifications would alert the network administrator of critical network events such as detection of viruses, intrusions, update notifications, license expiry date, etc. 34 Bandwidth Manager Simplifies the IT administrator’s task of allocating bandwidth on the basis of usage among users and user groups and saves the bandwidth cost of the company as you spend only on what you need. 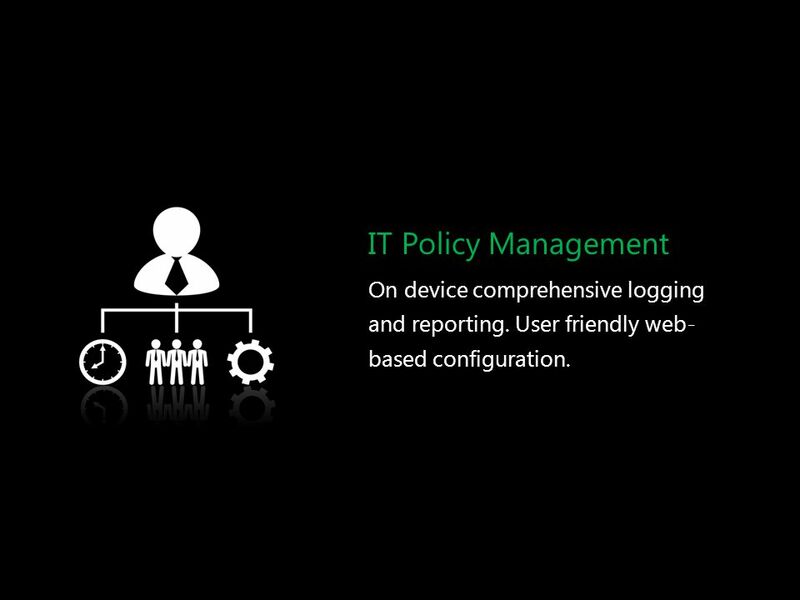 35 IT Policy Management On device comprehensive logging and reporting. User friendly web-based configuration. 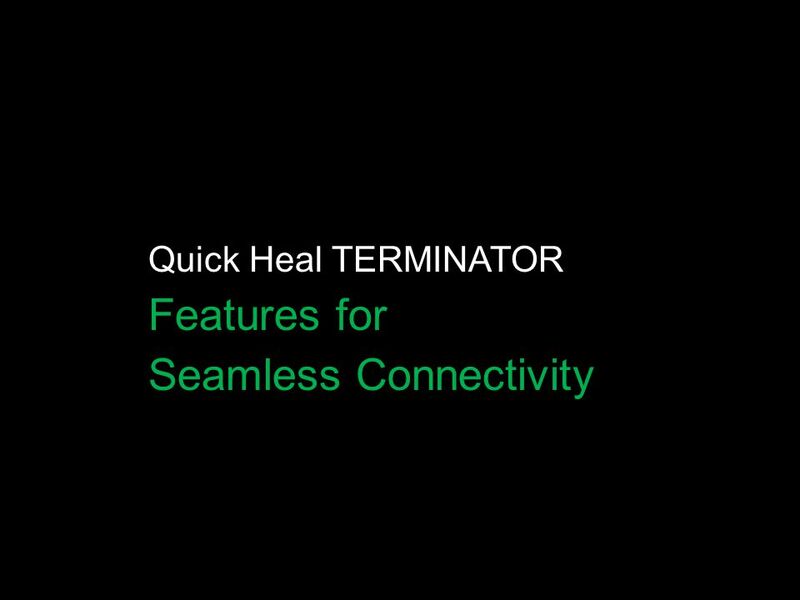 Quick Heal TERMINATOR Managing security is made simple. 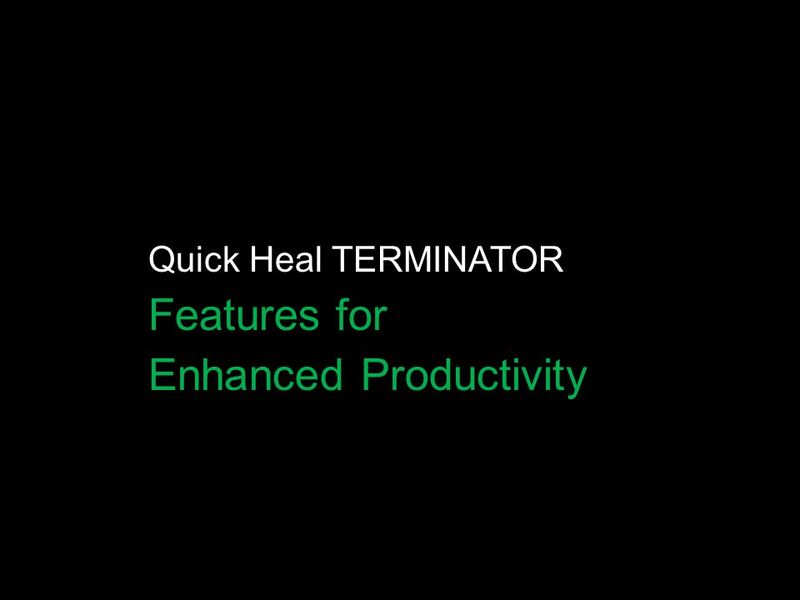 Download ppt "Introducing Quick Heal Terminator." 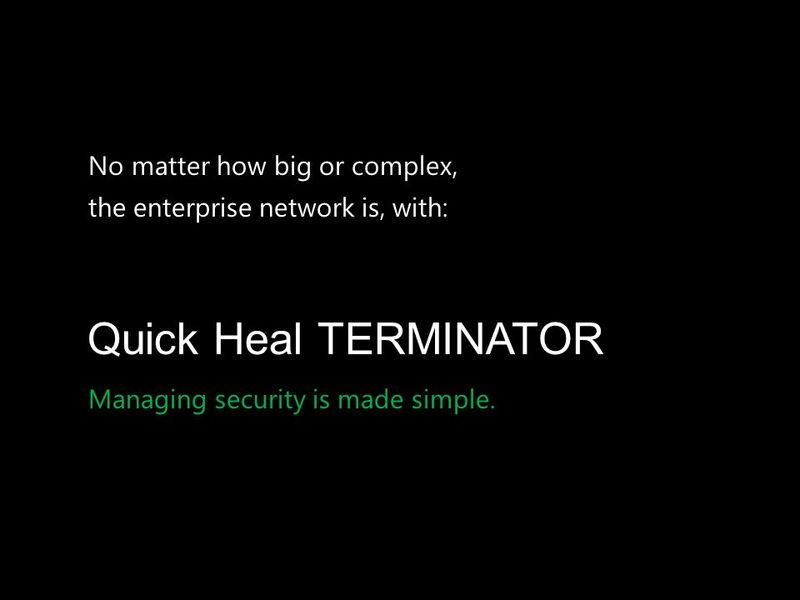 1 Effective, secure and reliable hosted security and continuity solution. Microsoft ® Exchange Online Advanced Security Name Title Microsoft Corporation. Computer Security: Principles and Practice Chapter 9 – Firewalls and Intrusion Prevention Systems. 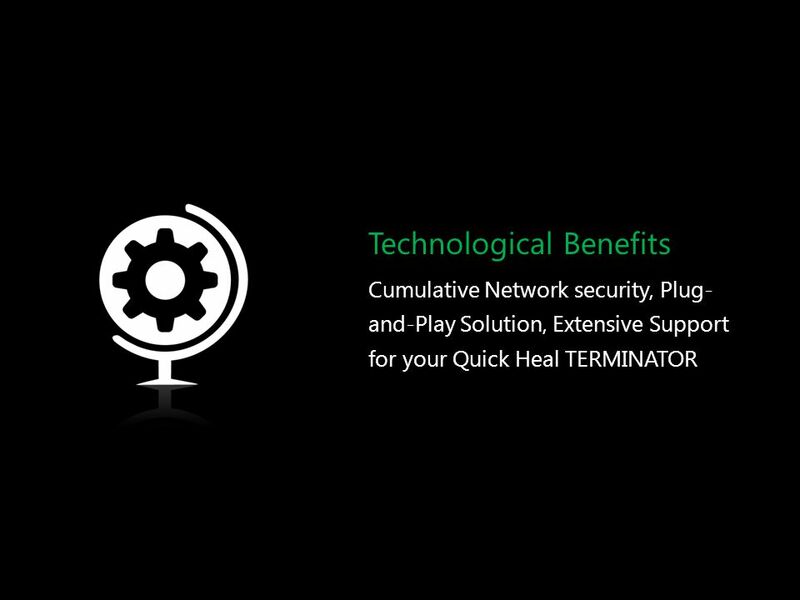 © Copyright 2012 Cyberoam Technologies Pvt. Ltd. All Rights Reserved. 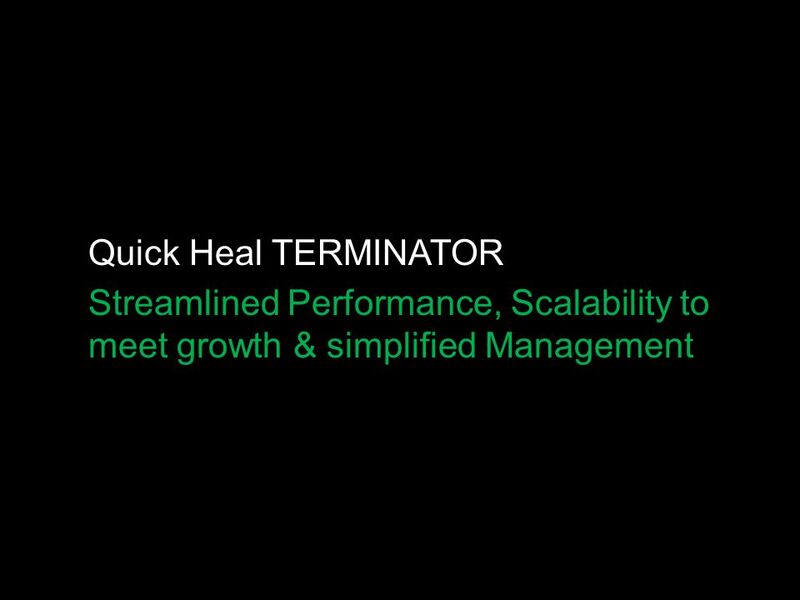 Securing You Cyberoam Virtual UTM Our Products Unified Threat Management. Adwait JoshiJim Harrison Sr. Product ManagerProgram Manager Microsoft Corporation SESSION CODE: SIA308. 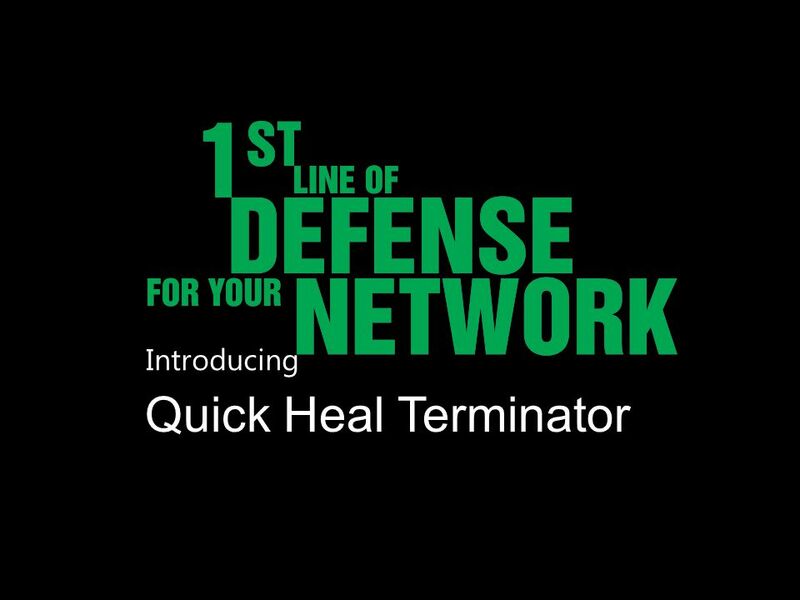 NCS welcome all participants on behalf of Quick Heal Anti Virus and Fortinet Firewall solution. Introducing Kaspersky OpenSpace TM Security Introducing Kaspersky ® OpenSpace TM Security Available February 15, 2007. Nada Abdulla Ahmed.  SmoothWall Express is an open source firewall distribution based on the GNU/Linux operating system. Designed for ease of use, SmoothWall. 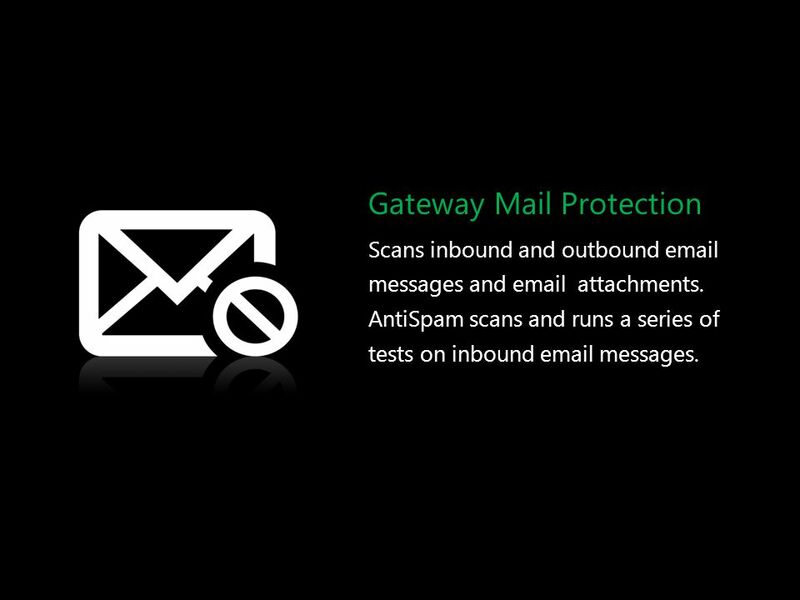 1 Panda GateDefender Performa Your First Line of Defense Product Presentation Name 2008. Building Your Own Firewall Chapter 10. Learning Objectives List and define the two categories of firewalls Explain why desktop firewalls are used Explain. MSIT 458: Information Security & Assurance By Curtis Pethley. Lesson 18-Internet Architecture. 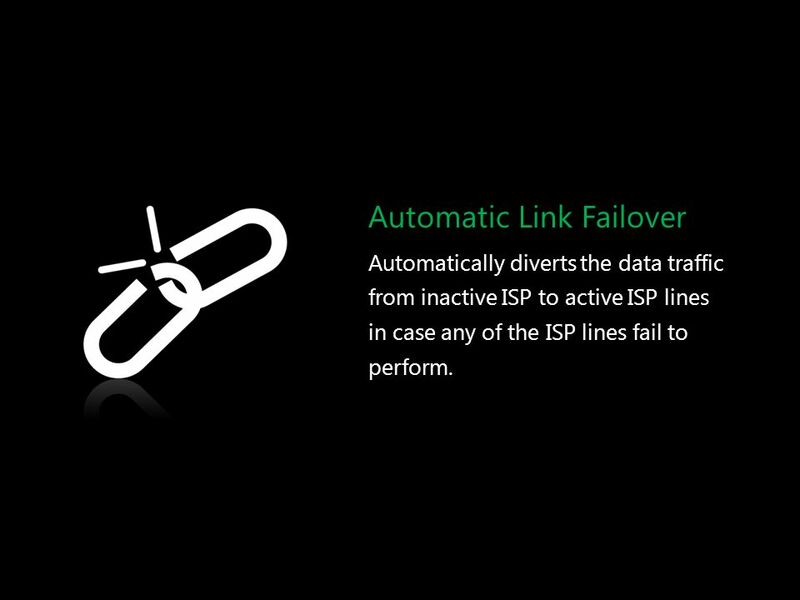 Overview Internet services. Develop a communications architecture. Design a demilitarized zone. Understand network address. Copyright 2011 Trend Micro Inc. Trend Micro Web Security- Overview. Security Management IACT 918 July 2004 Gene Awyzio SITACS University of Wollongong. Security Management IACT 418/918 Autumn 2005 Gene Awyzio SITACS University of Wollongong. 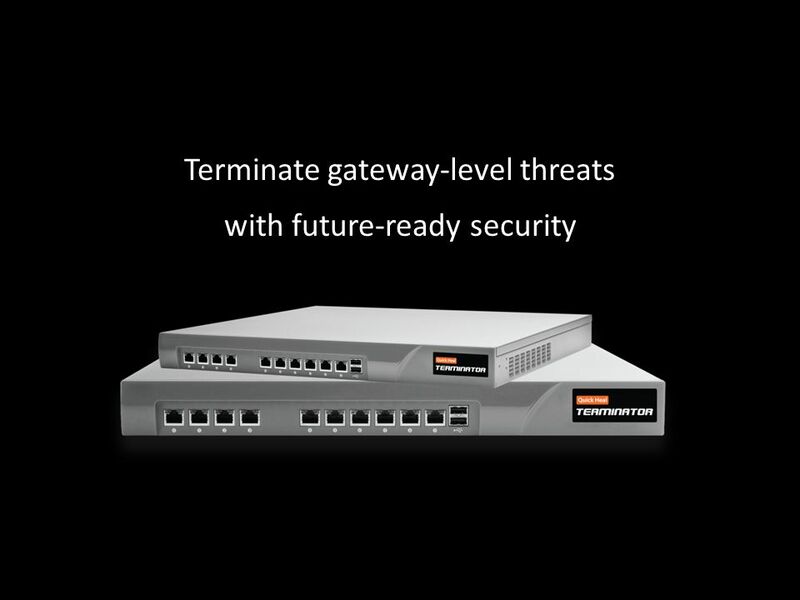 LittleOrange Internet Security an Endpoint Security Appliance. The ProactiveWatch Monitoring Service. Are These Problems For You? 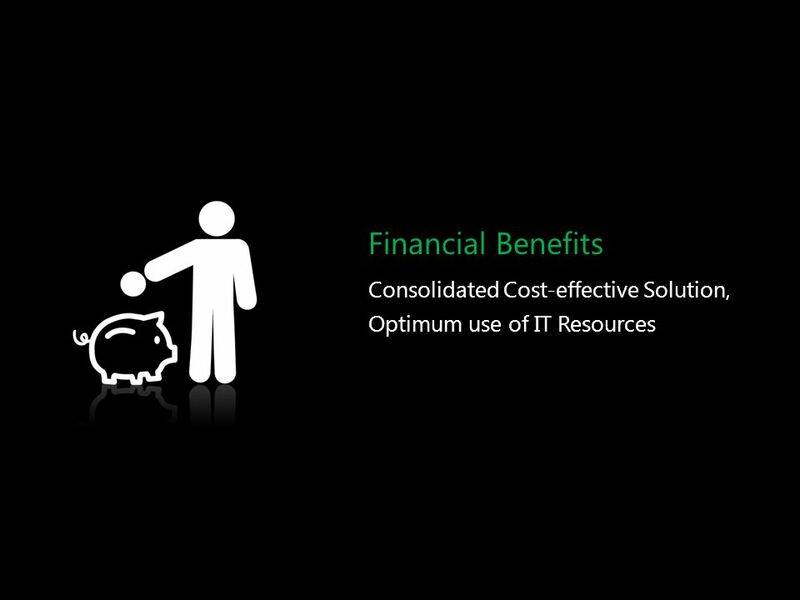 Your business gets disrupted when your IT environment has issues Your employee and.